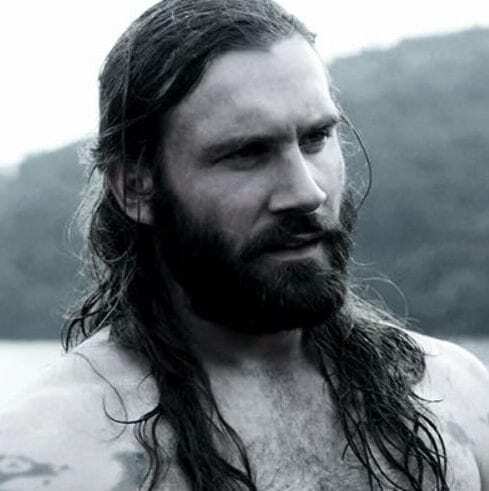 Before we plunge into our list of the 50 coolest and most rugged Viking hairstyles, answer us this question. Are you ready for the most epic haircut of your lifetime? 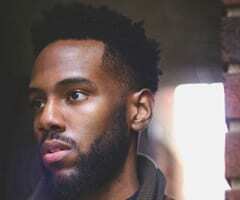 The one haircut you can wear into a battle? Because this is what you’ll get if you go for the Viking-inspired look. 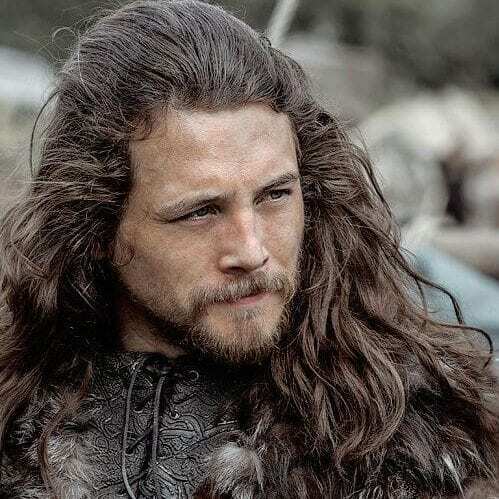 We have raided the Internet and amassed a list of 50 of the best hairstyles you could possibly wear as a Viking, including the ones sported by the cast of the original ‘Vikings’ show. Enjoy and Skol! 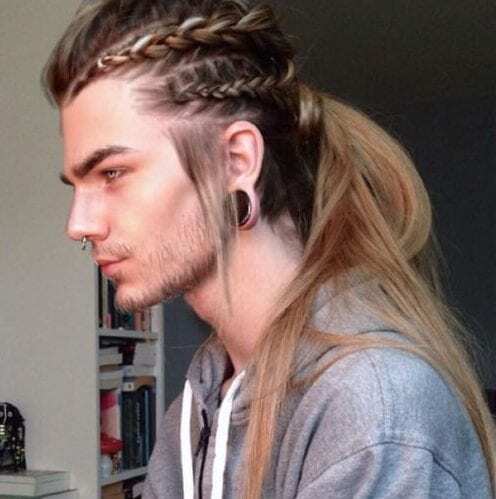 Whether or not this hairstyle combines Viking with elf is anybody’s guess. All we know is that it looks beyond cool and that we are dying to try it. The braids, as well as the sleek pompadour on top finish with a long, blonde ponytail. Even though your main occupation is to pillage and plunder, you can still keep it casual when you’re back at home in the Northern lands. Go for a half up, half down hairstyle with a few simple, three-strand braids on the sides. Did you know that it was the Vikings who conquered the northern part of France, aka Normandy, and gave it its name? Etymologically, it means the land belonging to the people from the north. Which indicates the Vikings. Therefore, a French braid and a bun are totally in order here. Sometimes, being a genuine rugged Viking is all about the attitude. Because without it, you can wear a slick back haircut or a pompadour, but it just won’t be the same. Therefore, brush up on your skill as well as on your look. Here is actor Alexander Ludwig’s hairstyle in real life. He plays Bjorn Ironside in the hit TV series Vikings, who helped give rise to the Viking trend. He looks awesome with natural blonde locks, an undercut, and a slick back, finished in a small ponytail. As you, probably, already know, braids were very big with the Vikings. They actually wore them in real life. Therefore, if you are to embrace Viking hairstyles, they must become a part of your life as well. Luckily, man braids are very in this year. The Allfather sees and knows all, and he is the source of everything that’s good on this earth. 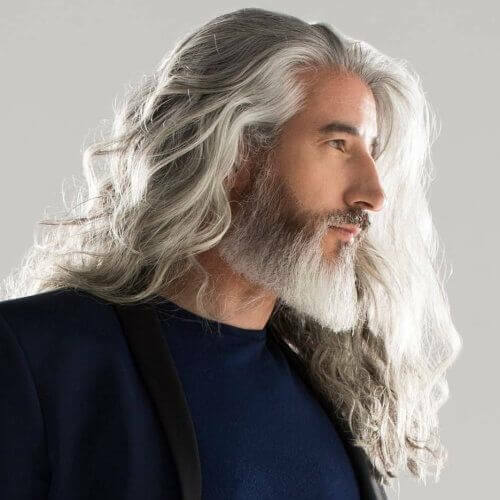 A true Viking seeks counsel with Odin, including when it comes to style. 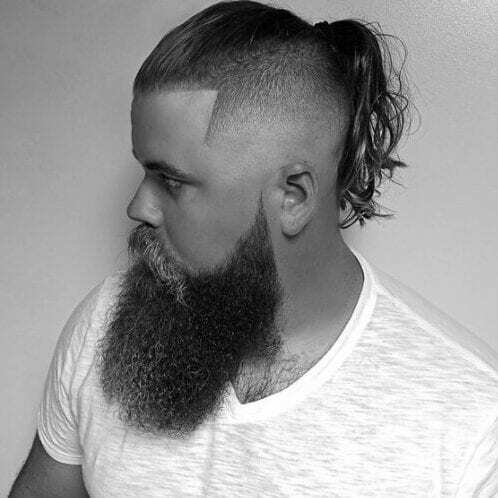 This is a slick back that finishes in a man bun. 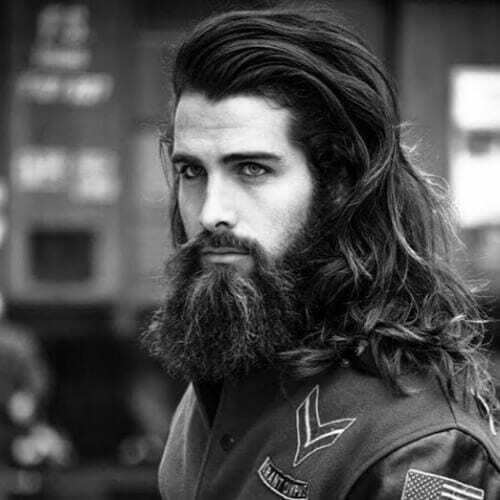 Another style choice for which the Vikings were very famous was their long and bushy beards. The reasons are not very clear. Some say it was to make them look as manly and savage as possible in battle so as to scare their enemies away with a single glance. 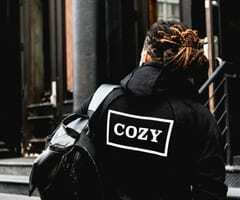 We just love the style. As far as cool Viking hairstyles are concerned, this one might just take the cake. 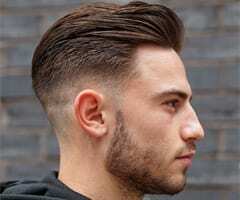 It’s a modern type of Mohawk, very long and sleek, that falls gracefully yet manly down the slopes of your back. 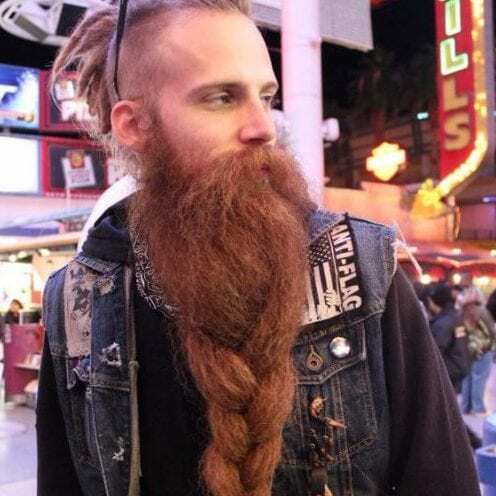 You can finely braid some strands to make it even more Viking. 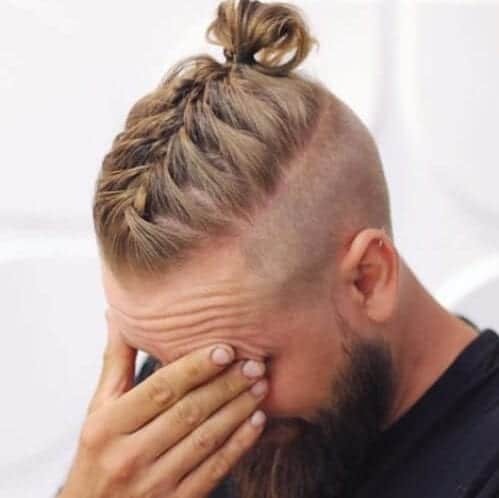 Although there is no actual evidence that the man bun was listed among the official Viking hairstyles, we can, probably, consider it an honorary one. 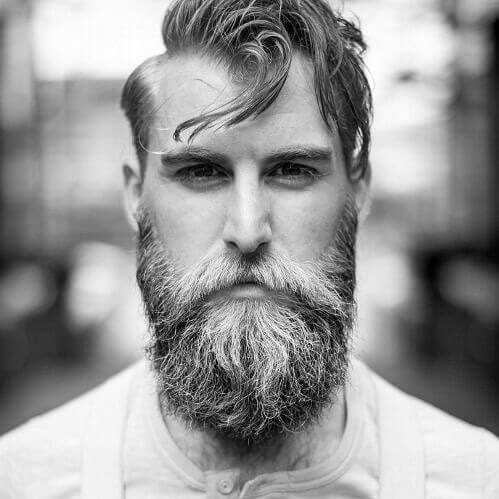 Especially if you know how to style it properly, so as to make it look really manly and rugged. 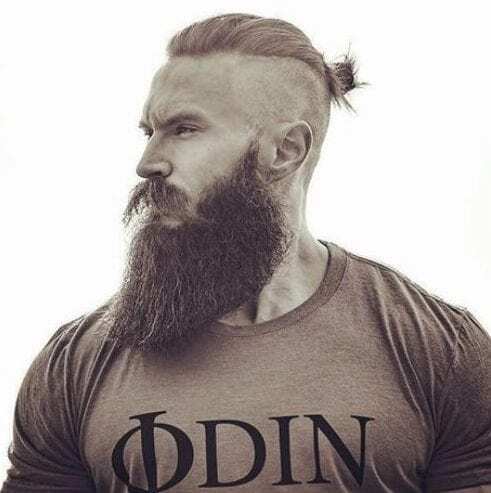 Having second thoughts about the man bun as one of the Viking hairstyles? Then how about a double man bun? That would mean twice the manliness, twice the ruggedness, and, of course, twice the number of maidens circling you. Here’s a hair color that bears resemblance to the traditional Viking hairstyles. As we all know, they were more or less a fair people, with blonde hair and light colored eyes. Therefore, we might not be wrong in saying that they had a few fire beards among them as well. And just how cool is that for a warrior name? Steinn Fire Beard, steinn meaning stone. As a Viking warrior, you would have to have braids. The longer, the better. 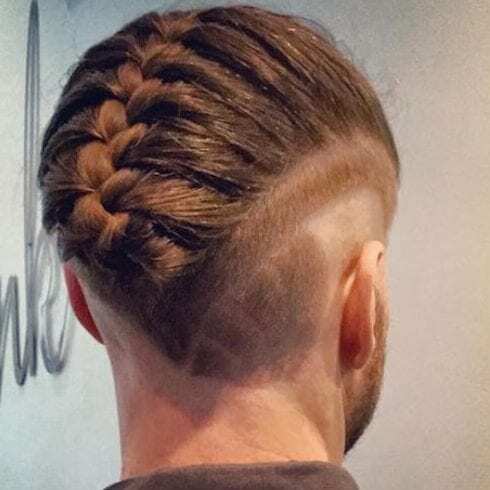 Pair them up with a well-groomed beard and you can actually wear these Viking hairstyles right into the 21st century because braids are really in. Vikings were a fishermen people when they weren’t very busy conquering other lands and pillaging them. Since they couldn’t do a lot of agriculture because of their geography and climate, fishing was their lifeline. Pay homage to that with your Viking hairstyle and this amazingly long fishtail braid. 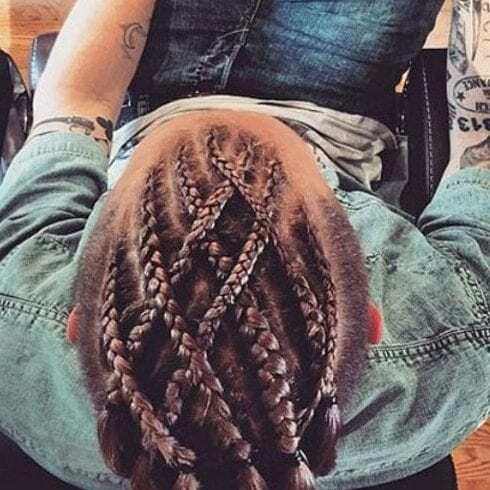 Another fashion in which you can wear your man braids is by crisscrossing them on top of your head. 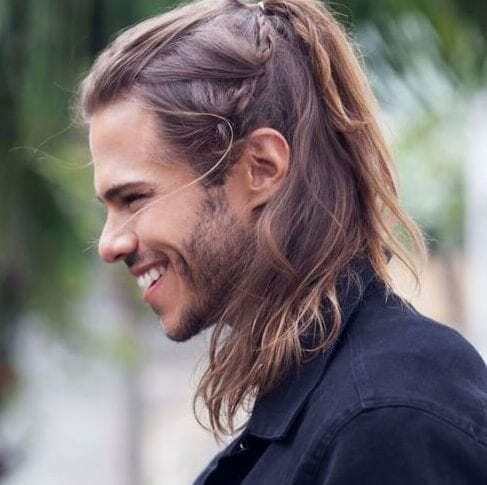 In this way, you will end up with a fabulous interconnected weave of braids that finishes in a small ponytail. 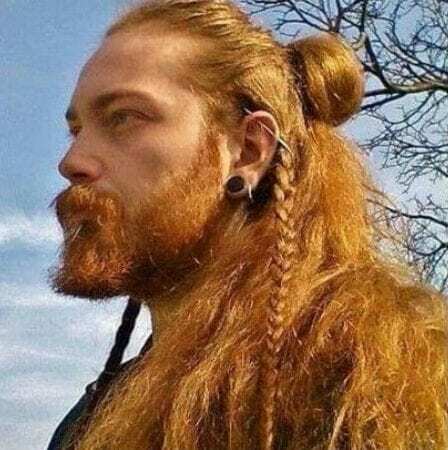 Now here is a fabulous example of Viking hairstyles. 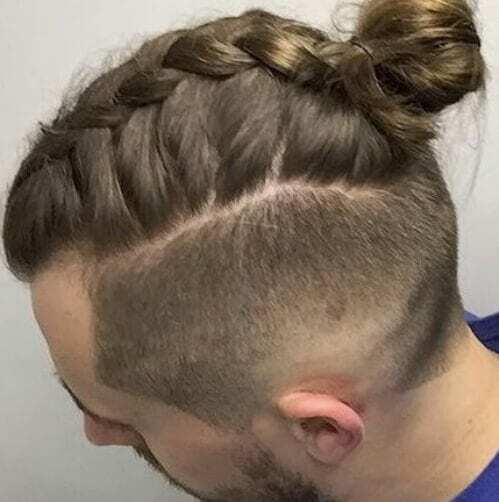 These are three perfectly executed French braids that finish in a man bun. The hair is dark chocolate with a caramel ombre, amazingly highlighted by the braids themselves. This might just be the definition of a man’s man, as far as we’re concerned. 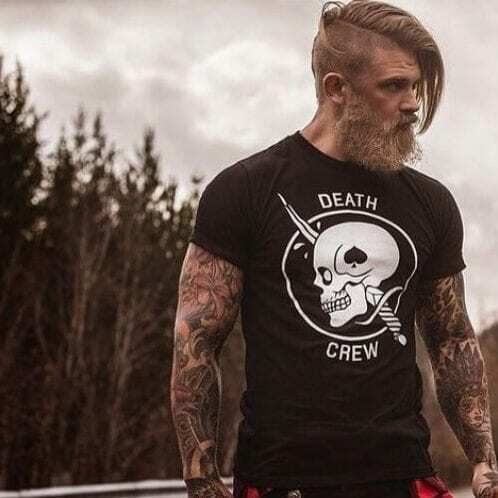 The T-shirt, complete with metal chain, lumberjack shirt, and sleeve tattoos, work perfectly well with the long, and asymmetrical Viking hairstyles. 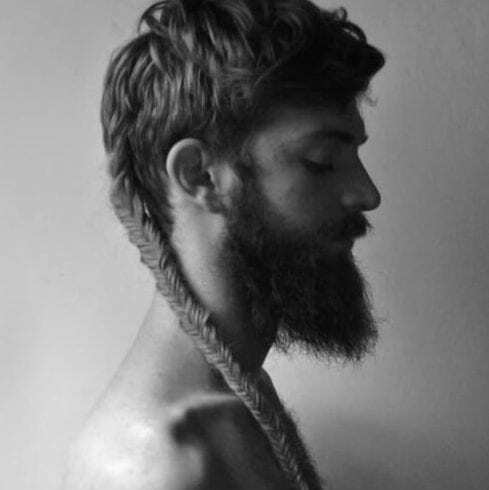 One of the staples of Viking hairstyles is the braided beard. You might have seen it in pictures and tried to replicate it yourself. It’s easier than you think. All you need is a lot of patience to wait for your beard to grow and tons of beard oil to groom it. We cannot overstate this enough. Man braids are completely in this year. 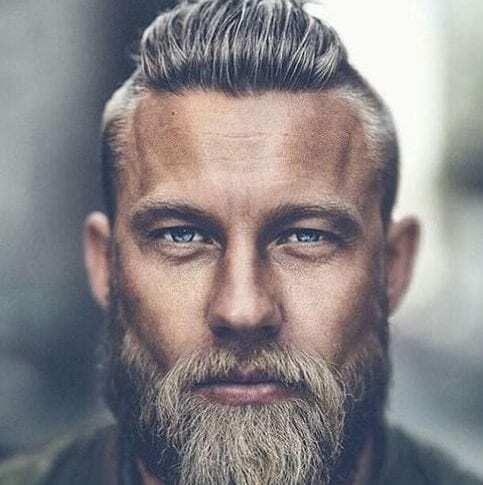 Beauty specific sites such as Instagram and Pinterest are absolutely flooded with pictures of men all over the world going Viking on their hair, as they should. We totally support it. 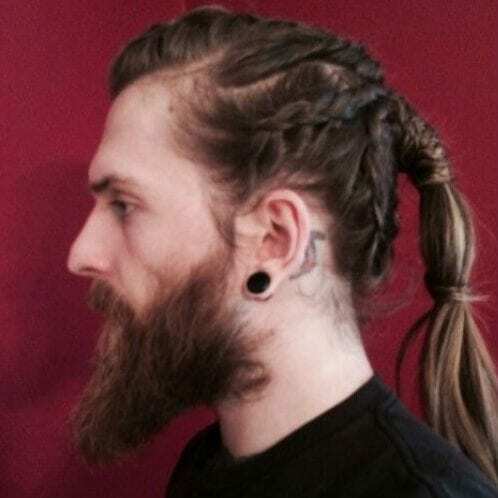 Speaking of man braids and Viking hairstyles, here’s an interesting way in which you can mix them up. Use your long, warrior tresses to create one single braid that will give the illusion of a mohawk without actually having to shave your head. We begin here the list of the real Vikings, the ones from the eponymous TV show, and their hairstyles. 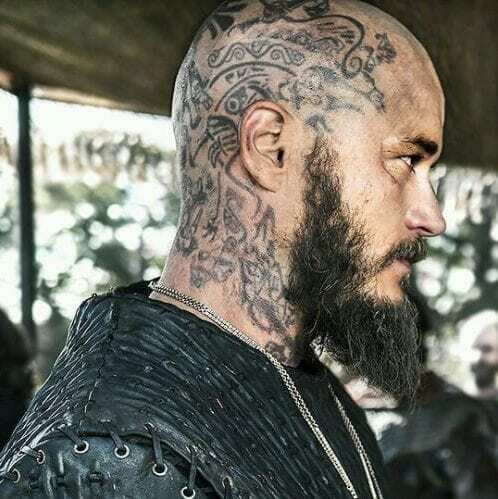 And who better to start us off than the king himself, Ragnar Lothbrok. He had several hairstyles throughout the show, all inspired from reality, as far as history tells us. 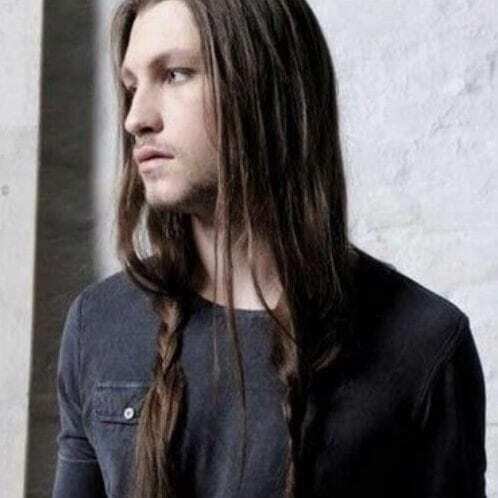 This is him when he was young, with a small beard, shaved sides, a slick back, and very long hair that was braided and held together by leather threads. Cool! If we are to believe history once more, and we should, this is what a true Viking would have looked like. Tall, strong, and savage in appearance. Their preferred combat tactic was instilling fear into their opponent’s hearts by looking like barbarians. Hair played a crucial part. 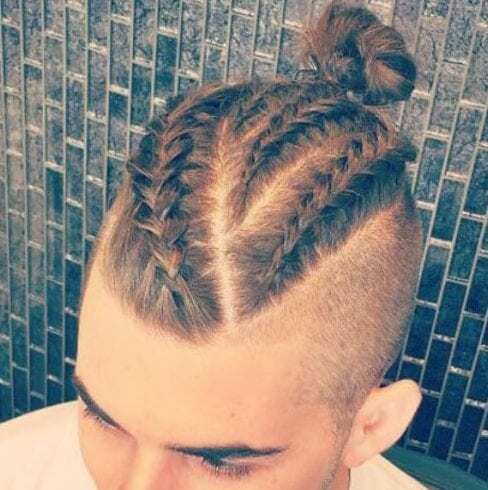 Bring Viking hairstyles into the modern age and make them appropriate for the streets, a club, a restaurant or for school with this hip twist. 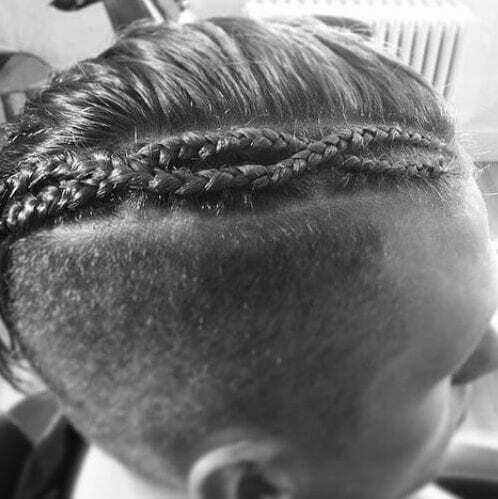 These are very short man braids accompanied by a fancy and very high pompadour in the front. 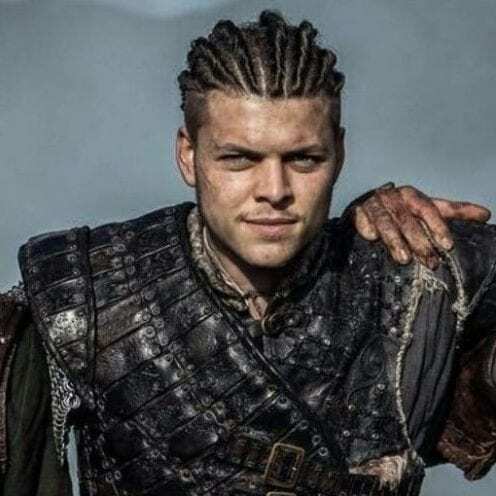 While we don’t really know why he was called the Boneless, history does tell us that Ivar was, indeed, Ragnar’s son and that he was absolutely savage. Moreover, this is the man to whom we owe England as the country we know today. Here he is on the show with a set of twisted cornrow braids and a taper fade. Sometimes, even a Viking has to be elegant, especially if he lives in the 21st century and not 1000 years ago. This is a medium cut with a hard part on the side and a few strands of hair on the forehead that remind us of Clark Kent. 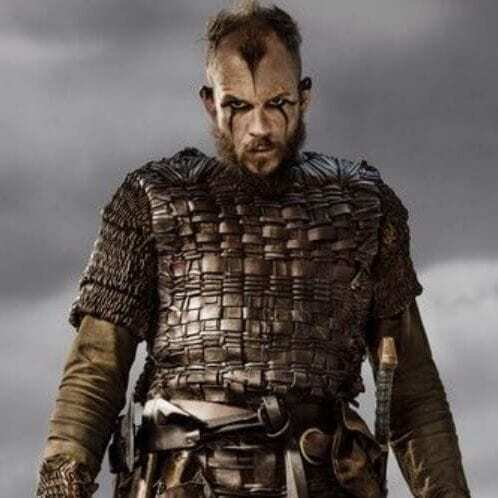 Ragnar may be king, but Floki is the one who completely stole the show in the TV series, thanks to actor Gustaf Skarsgard’s outstanding performance. 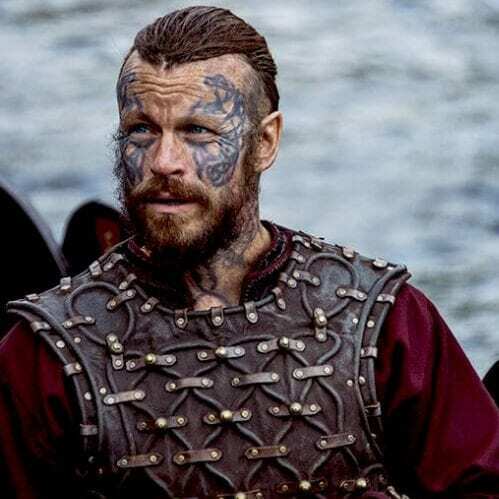 His hairstyle is absolutely unique in the world of Vikings, as is his black eye makeup. Ragnar’s brother Rollo is the warrior by definition. 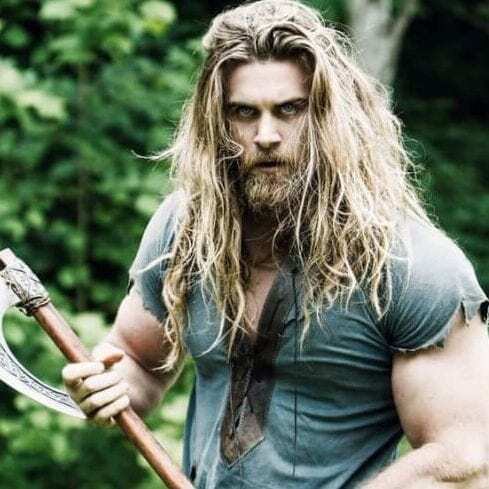 He embodies the savage Viking who fights naked and has a bushy beard and long, black hair, to scare off his enemies. According to real history, he is the one who conquers the north of France and creates what we now know as Normandy, the land of the Norseman. 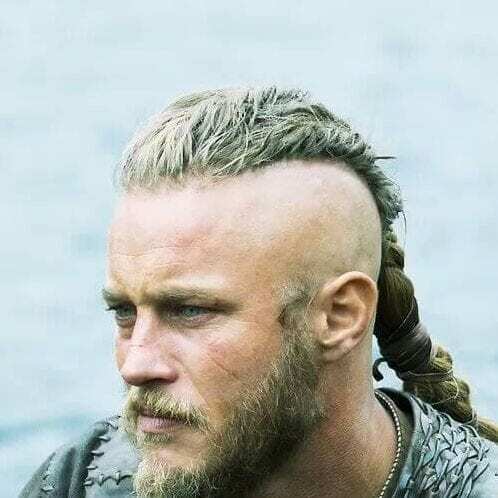 As the series progresses, we get to see an old Ragnar, and how Viking hairstyles might have aged through the years. 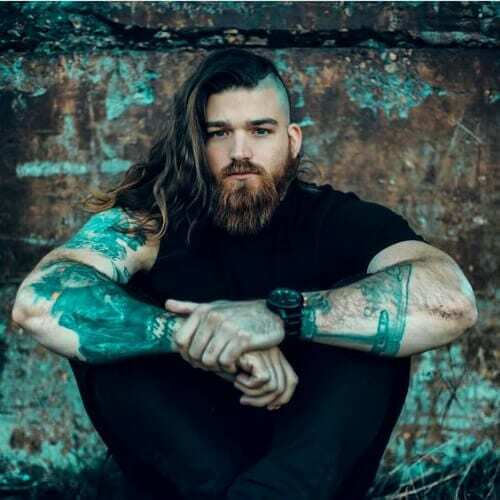 His head is completely shaved off, in penitence and remorse for the death of one of his best friends, he still has a bushy beard, as is the Viking custom, and he has added even more tattoos to his scalp. 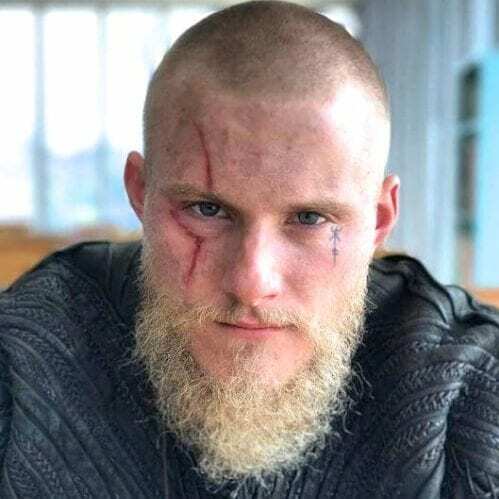 We’ve already seen actor Alexander Ludwig as young Bjorn Ironside, King Ragnar’s son. Here he is older in age, with a different approach to Viking hairstyles. 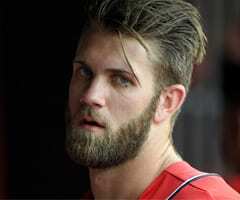 Just like his father, he too has cut his hair very short but has kept his beard, and has more tattoos to be proud of. 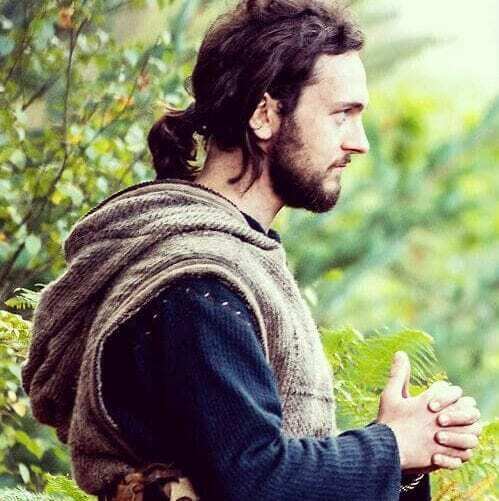 Athelstan, the Christian priest turned Viking changed his hairstyle as well when he denounced his former monk lifestyle and joined the pillaging hoards. He wears a medium sized haircut and his natural hair is curly and dark chestnut in color. This is Harald Finehair. 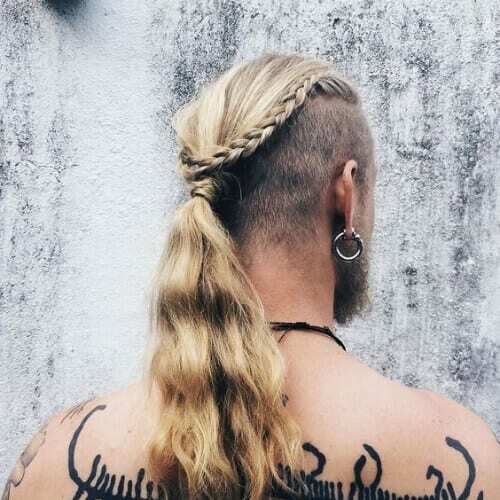 With a name like that, how could we have not included him on our list of the best Viking hairstyles? Harald is a king himself and an ally of Ragnar’s. He wears his hair twisted in very fine braids which he then ties back in a ponytail so that he can showcase his awesome face tattoos. 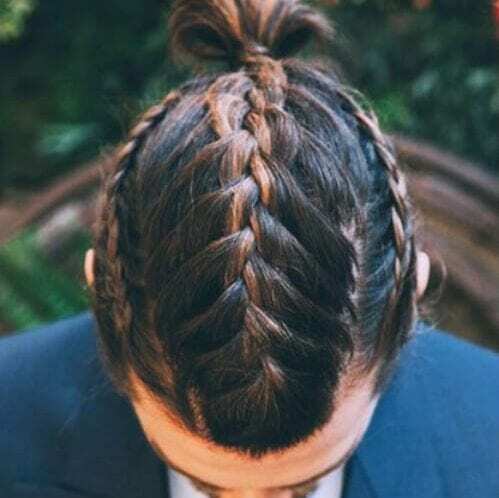 Not only is this a gorgeous example of braided undercut hairstyles, but you can also see how the braids themselves cut diagonally across the crown of the head. This adds a plus of elegance and whimsy to the whole thing. 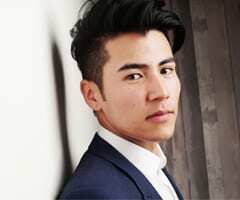 We have already seen a lot of these undercut with asymmetrical strands in hairstyles that have been slicked into perfection using hair wax or even gel. However, if you have a more casual style, you can always wear your hair a bit messier. If you have wavy or curly hair, it would be a real shame if you didn’t show it to the world. Especially if you also possess the heart and build of a Viking. Channel your inner Norseman and grow your hair to a medium size. The Mohawk is a staple of the punk generation, we all know that. However, if you have a keen eye and a great sense of style, you can easily incorporate it into your Viking overall fashion. Pair it with a bushy beard and some earrings, and you’re there. 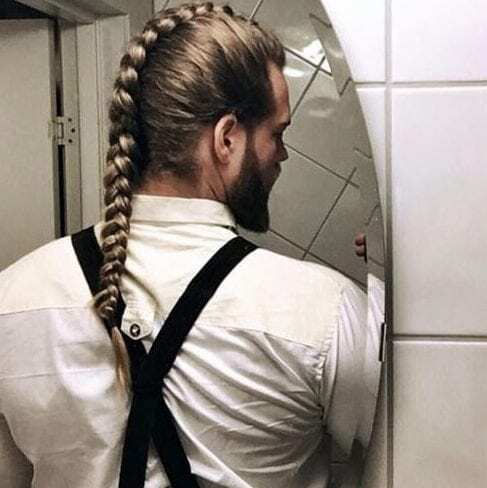 Your long hair can also serve as inspiration for a number of other Viking hairstyles. 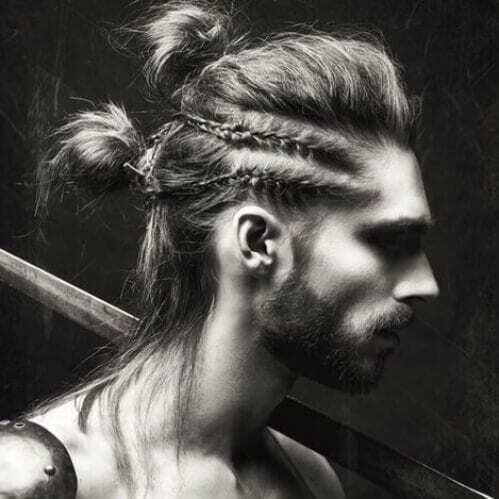 For example, you can use it to carve out this amazing warrior ponytail, complete with a taper fade and one of the most amazing beards ever. Yes, we know. Wrong show, you’ll say. But we do believe that author George R.R. Martin did have the Vikings in mind when he wrote the character Tormund in A Song of Ice and Fire. 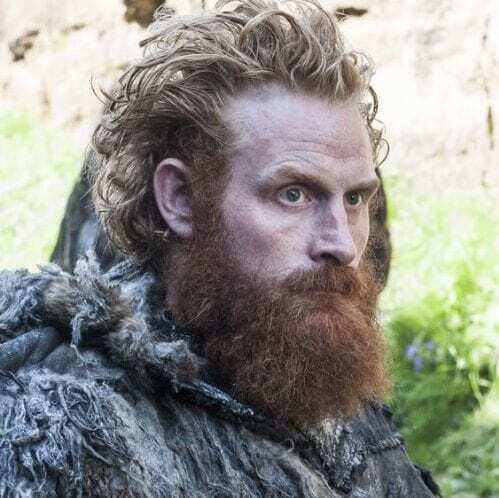 Therefore, you can use this wildling as inspiration too. Here’s another character from the Vikings TV show. This is Earl Kalf, and he wears his hair in an entirely different way. He has long, brown, and luscious hair which he slicks back in a half up, half down ponytail. Some of the Norsemen were platinum blonde, as history suggests. Therefore, if you really want to look like them you can always dye your hair in this color. 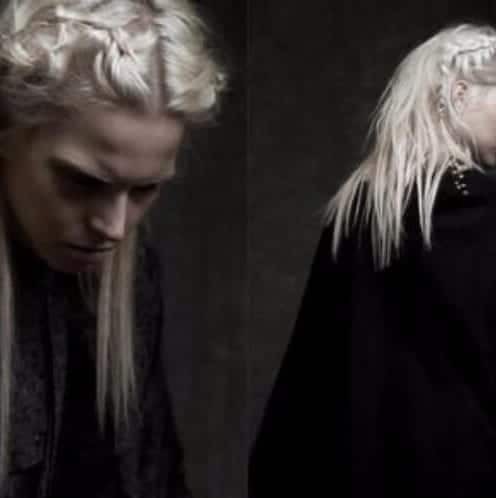 Don’t forget the braids and the long, black cloaks. It is a commonly known fact by now that Vikings were also the ones who first discovered America. Therefore, who knows the traces and legacies they might have left behind? 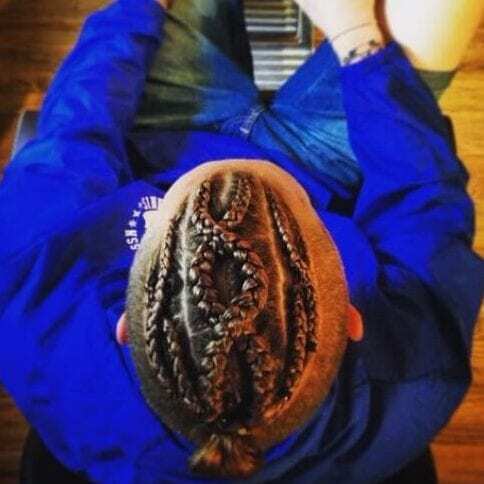 In their honor, sport this intricate and weaved set of braids. This hairstyle is quite amazing. 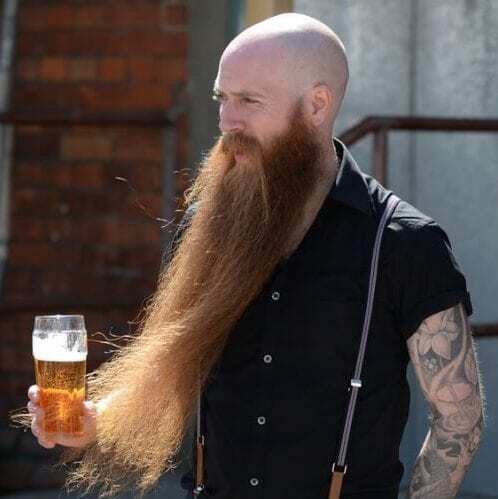 Half of your head is supposed to be shaved off while the other half still has its long strands. In the middle, you have two simple three strand braids that interweave in a helix to mark the borders. 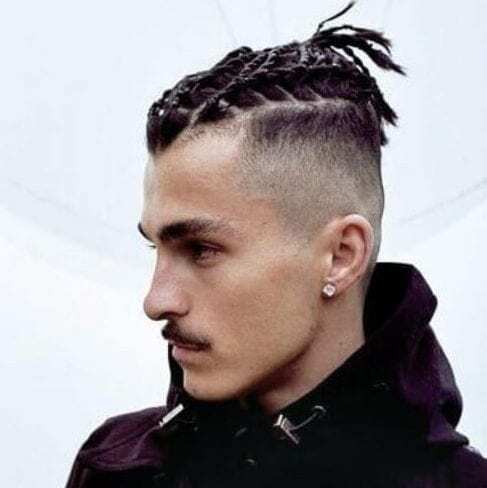 If you’re not a fan of the knot, man braid or ponytail as a way to finish off a man French braid, you can always tuck in the ends. It will create a very elegant look that you can even wear for a special event, such as a wedding. This is a variation of the helix we saw earlier, only a lot bigger in size. It’s time to get creative with your Viking hairstyles and allow them to transform you into a real warrior from a thousand years ago. 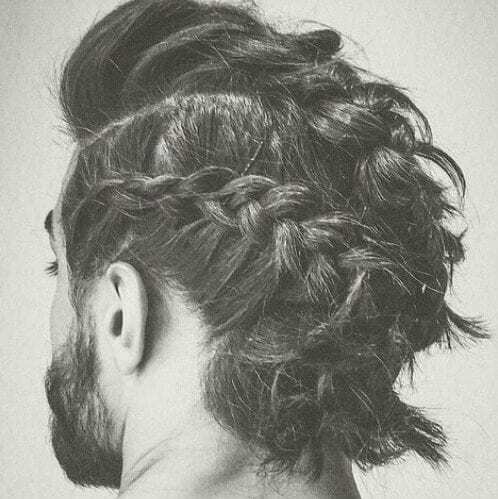 If you find some of these man braids a tad too complicated or time-consuming for your taste, you can always opt for something a lot simpler. Part your long hair in two and loosely braid it three ways. Let it hang freely down your shoulders. 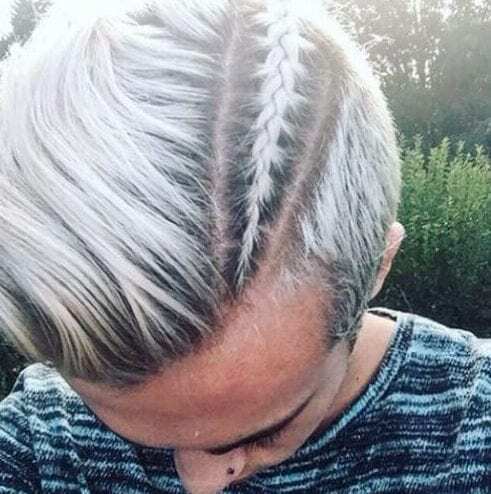 Nothing says Viking hairstyles better than a platinum blonde hair color and a perfectly done man braid. Make sure your roots are darker than the ice blonde so that it looks natural. 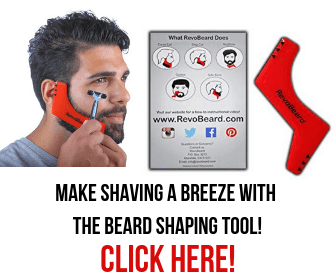 Create some hard parts with the help of a razor. There is no definitive record stating how long their hair was. Therefore, it’s entirely up to you how you want to wear it. However, we suggest a medium length because it may be the easiest to manage and maintain. 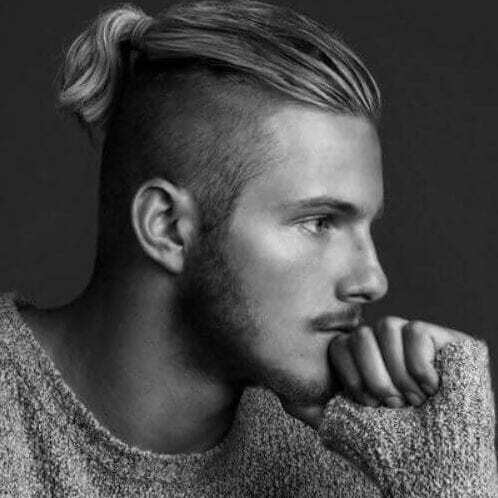 This man bun is incredibly easy to pull off. All you need is to moisturize your hair every time you shower using a very good conditioner. In this way, you can keep your locks as silky and manageable as possible. If you’re wondering how does the Viking style mature, wonder no more. This is what a middle-aged warrior looks like. 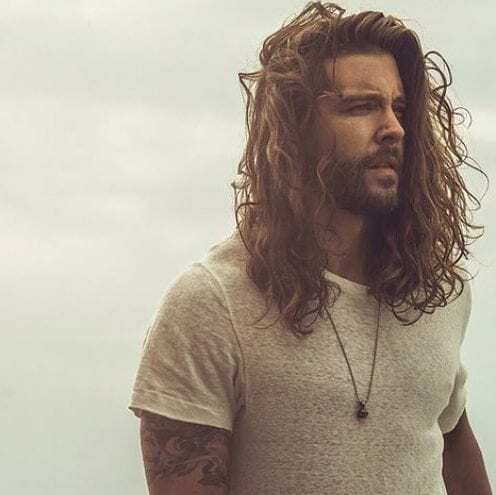 He has gorgeous salt and pepper long hair with natural curls and a very well-groomed beard. Remember that there are no rules when it comes to the modern Viking game. The important thing is that you feel good and that this haircut empowers you to be the warrior you always felt you had on the inside. If you think ponytails are a bit too boring, then you can dress them up. Add an undershave and a braid. Suddenly, the plain ponytail has become the playground for something spectacular to behold! 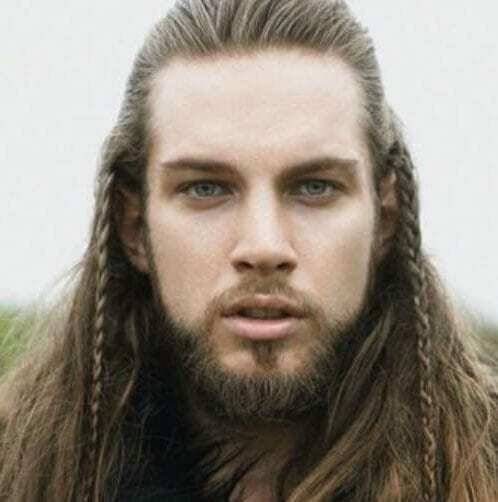 Looking at these 50 cool and rugged Viking hairstyles, do you think that if a hoard of Vikings were able to time travel to our lands today, could they fit right in? We think so. 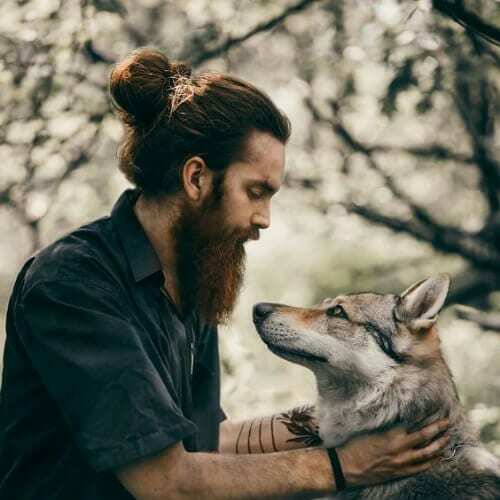 We hold long, and bushy beards and man braids in high fashion, and we love artisanal beer. All hail Odin, the Allfather!